Pad, body mounting. 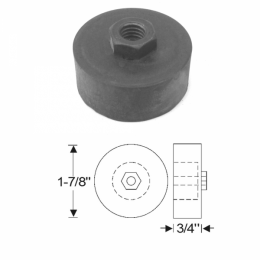 Rubber with metal nut and washer molded in. One and seven eighths inch (1 7/8") outside diameter by thirteen sixteenths inch (13/16") nut outside length by seven sixteenths inch (7/16") inside hole diameter. Three fourths inch (3/4") circular base height by one fourth inch (1/4") nut height by one inch (1") overall height. Replaces factory #1359620. MADE IN THE USA.